Summary: Enterprise systems pose something of a “Catch-22.” If you don’t customize the system, it won’t perfectly fit your needs. If you do customize it, you’re locked into that system. Watch this short video to learn how to avoid these problems and customize your enterprise system without locking your company down. As technology plays an increasingly important role in the business, IT departments are evolving. They’re moving from a back-office function that supports the business to a true business driver. The problem is, many of these CIOs and IT leaders are still stuck working with limited budgets. IT budgets took a beating in the recession a few years back, and many still haven’t recovered. In fact, according to Computerworld’s yearly report, 64% of IT leaders report either a flat or smaller budget this year over last. The question is, how can CIOs and IT leaders make the most out of their budgets? While being called upon to play a larger role in the business, many must do so with limited resources. How can they succeed? Today, I’d like to answer that question and explore a few ways CIOs and IT leaders can save money. Now, when I say “save money,” I’m referring to long-term savings. I’m not interested in short-term cut-backs with long-term consequences. I’m interested in money-saving methods that will not only reduce costs, but prepare your company for future success. It’s a sinking feeling. You realize that you’ve lost countless hours. Thousands (if not hundreds of thousands) of dollars are simply gone. Everyone blames you. Business software purchasing mistakes are expensive (and embarrassing) lessons. Especially if you’re the one making the decision. For you, it’s more than a software purchase. You stake your pride and reputation to that purchase. If the software doesn’t meet expectations, it’s on you. What makes a software purchase go south? The reasons vary. Maybe the software didn’t live up to the hype. Maybe it became prohibitively expensive over time. Maybe it couldn’t meet your company’s future needs. I could go on. Whatever the reason, it’s always an expensive, embarrassing lesson. The question: How can you avoid these mistakes? If you’re in charge of software purchasing, I’d like to help. While every business and situation is different, there are a few areas every business must consider before purchasing business software. To help you identify those areas, I’ve solicited input from experts on the subject and compiled their advice below. Here are 10 tips that will help you purchase software that you won’t later regret. Stuck with an outdated application? Here’s a solution. – the fact that their application vendor is out of business. But the problem remains. These companies are locked into their current software. Meanwhile the world is changing at an ever increasing rate. Their applications are looking and feeling dated, and the company is falling behind their competition. Is your company facing this problem? If so, here’s a new guide that might help: 21 ways m-Power will improve your enterprise systems. It outlines and explains m-Power’s unique approach to enterprise system integration, what types of modern features it lets you add to your existing system. How much does native mobile app development cost? Cost is one of the reasons we advise businesses against building native mobile apps. Of course, there are many more reasons we advise against native apps, but I won’t get into them in this article. You can always read this white paper if you’d like to learn more. Today, I’m focusing on native app cost. Simply put, native apps are significantly more expensive to both develop and maintain than hybrid or mobile web apps. Do you know why end users still use spreadsheet programs (like Excel) so frequently, despite all of the security concerns? The answer is simple: Spreadsheets are easy. Sure, maybe they’ve sat through training classes on how to use your enterprise software. Maybe they already learned about the dangers of spreadsheet misuse. Maybe you’ve even given them a safer alternative to spreadsheets. But, here’s the problem: If the process isn’t as easy (or easier) than Excel, they probably won’t use it. What do television, personal computers, the radio, electricity, and the internet have in common? A couple of things actually: First, each one represents a major technology shift. Second, each one was adopted at a slower pace than smartphones have been adopted in the U.S.
That’s right. According to these statistics, smartphone adoption is faster than any other major technology shift in the U.S.
Now you see what all the mobile app fuss is about. Businesses aren’t just rushing towards the latest trend, they’re rushing to take advantage of the fastest growing technology shift in history. But, be careful. 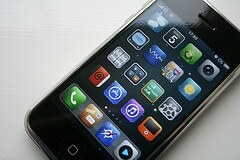 Mobile app development isn’t something you should approach blindly. Understand your options and the pros and cons of each approach before you begin, and you’ll avoid a heap of problems. 1. Manually: This involves employees manually logging inventory on paper, and then entering that information into their system. This is the cheapest option, but also the most time consuming. 2. Barcode scanners and software: This involves employees scanning inventory with barcode scanners, which automatically update the system. This is certainly much faster than tracking inventory by hand, but purchasing all of the scanning equipment and software can get expensive. How will mobile change this? Mobile provides an inexpensive, yet efficient method to track inventory that can easily replace expensive barcode scanners. Here’s a great story that illustrates this point: A medical supply distributor needed a better way to track incoming inventory. Rather than purchase expensive scanning equipment, they used mobile apps running on standard smartphones that automatically update inventory levels in their system. The result: They nearly automated inventory logging while using inexpensive, off-the-shelf parts. That’s just a quick summary, but you can read the whole story right here.